Framed by sun-splashed vineyards and rugged mountain peaks, the picture-perfect valleys of the Cape Winelands are famous for their grand old estates, pretty little towns, award-winning restaurants and, of course, their wine. An easy hour’s drive from Cape Town, a Cape Winelands journey perfectly complements a stay in one of the world’s favourite cities. Luxurious manor houses and secluded boutique hotels with the softest robes and the whitest towels make the Cape Winelands an obvious choice for a honeymoon or romantic break but it may surprise you to learn that kids love this area too. There’s a wide selection of family-friendly accommodation, outdoor activities such as mountain biking, horse riding and quad biking, and many wine estates have big picnic-perfect lawns for you to enjoy a day in the sunshine. To really know a place, you must walk the place. Wander the oak-lined streets of Stellenbosch, stop in at art galleries and coffee shops, or pick and choose from the many excellent restaurants in Franschhoek – the undisputed culinary capital. Parts of the Cape Winelands have been recognised for their intangible cultural heritage; from diverse styles of architecture to a four century-deep tradition of winemaking. 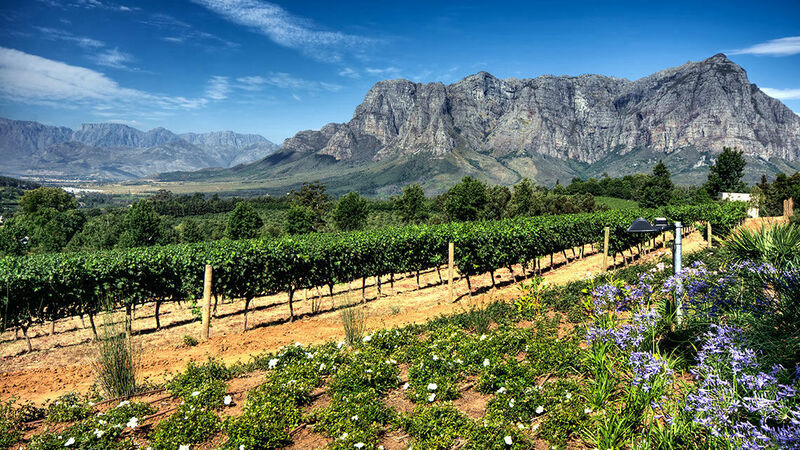 This region is also home to the oldest wine route in South Africa, Stellenbosch Wine Route founded in 1971.